﻿Safe for Life Primary Times Magazine review, Issue 152. “Animals on top in a world of villains. Festival Comment: "'Born to Dance' is a delightful and well-structured children’s adventure that captures the magic of the circus, and the thrill of being on your own in the world. Katherine Reynolds’ strong voice and skilled plotting was honed in years of professional endeavors in television, film and journalism. Unlike many writers, her work does not bog down in the third act, and the ingenious twists offered in her tale never pander to the young readership." 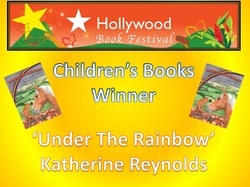 Literary Magic Magazine -Writer Spotlight - Summer Edition "Reynolds delivers a masterpiece with 'Born to Dance', a Children’s book that is about much more than talking and performing animals. It is about love, hard work, friendship, and above all, hope. Hope is a simple concept. Just one word. But 'Born to Dance' takes the word “hope” to the next level. 'Born to Dance' will leave readers excited for more.” Comment: "'Born to Dance' is a delightful and well-structured children’s adventure that captures the magic of the circus, and the thrill of being on your own in the world. Katherine Reynolds’ strong voice and skilled plotting was honed in years of professional endeavors in television, film and journalism. Unlike many writers, her work does not bog down in the third act, and the ingenious twists offered in her tale never pander to the young readership."